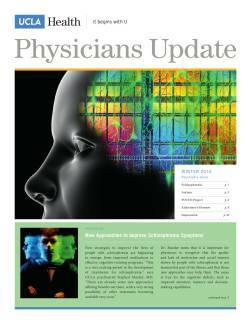 COVER STORY STORY HIGHLIGHTS New Approaches to Improve Schizophrenia Symptoms (continued from cover) New strategies to improve the lives of people with schizophrenia are beginning to emerge, from improved medications to effective cognitive-training programs. Until recently, treatments available for schizophrenia have been dominated by antipsychotic drugs. Various cognitive-training programs have been designed to help patients improve memory, attention and social recognition. UCLAHEALTH.ORG Until recently, treatments available for schizophrenia have been dominated by antipsychotic drugs. While such medications reduce the hallucinations and delusions associated with the disorder, they fail to address the major symptoms that impede the daily function of people with schizophrenia — from their school performance to their ability to thrive in the workplace. The need for medical treatments to improve cognition and negative symptoms for people 1-800-UCLA-888 (1-800-825-2888) with schizophrenia led the National Institute of Mental Health to fund a large initiative, Measurement and Treatment Research to Improve Cognition in Schizophrenia (MATRICS), based at UCLA. The initiative is headed by Dr. Marder and Michael Green, PhD. The effort focused on developing better instruments for measuring cognition and negative symptoms in clinical trials, as well as a scientific consensus on the neurobiology underlying these impairments and the most fruitful potential molecular targets for new drug compounds.